Tom Whitehouse is founder and chairman of the London Environmental Investment Forum (LEIF) and Contributing Editor at Global Corporate Venturing (GCV). LEIF is an advisory business that convenes and connects capital, big business and new environmental technologies and technologists. Since being authorised by the UK’s Financial Conduct Authority in 2008, LEIF has raised over $60m for early stage businesses and venture capital companies. Current clients include Innovate UK, the British government’s innovation agency, Saudi Aramco Energy Ventures, Airbus and leading British and European start-ups. For Global Corporate Venturing, a research and publishing company, Tom writes reports and chairs conferences on innovation in energy, transport, advanced materials and manufacturing, and water. 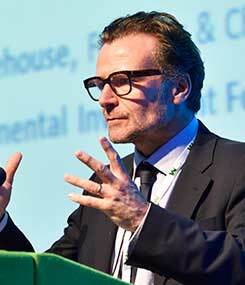 He also writes GCV’s ‘The Clean Deal’, a monthly column on global innovation trends. Tom started his career as a foreign correspondent. From 1997-1999 he was Moscow correspondent for The Guardian. From 1991-1997 he was a reporter for the BBC World Service, based in Prague and Moscow. "A gifted public speaker and leading authority on environmental technology, innovation and investment, Tom is well placed to offer a detailed look into future of industries including: energy, transport, advanced materials and water. "